The algorithm is to build solids from set of shapes. It uses the BOPAlgo_Builder algorithm to intersect the given shapes and build the images of faces (if needed) and BOPAlgo_BuilderSolid algorithm to build the solids. Fields: <myIntersect> - boolean flag. It defines whether intersect shapes from <myArguments> (if set to TRUE) or not (FALSE). The default value is TRUE. By setting it to FALSE the user should guarantee that shapes in <myArguments> do not interfere with each other, otherwise the result is unpredictable. <myBBox> - bounding box, covering all faces from <myFaces>. <mySBox> - Solid box created from the corner points of <myBBox>. <myFaces> - the list is to keep the "final" faces, that will be given to the BOPAlgo_BuilderSolid algorithm. If the shapes have been interfered it should contain the images of the source shapes, otherwise its just the original faces. It also contains the faces from <mySBox>. <myArguments> - list of the source shapes. The source shapes can have any type, but each shape must not be self-interfered. compound of solids - if created more than one solid. 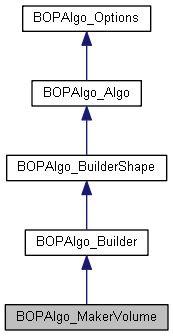 BOPAlgo_AlertSolidBuilderFailed - BOPAlgo_BuilderSolid algorithm has failed. Returns the solid box <mySBox>. Returns the processed faces <myFaces>. Fills the solids with internal shapes. Defines the preventing of addition of internal for solid parts into the result. By default the internal parts are added into result. Sets the flag myIntersect: if <bIntersect> is TRUE the shapes from <myArguments> will be intersected. if <bIntersect> is FALSE no intersection will be done.